In the long course of its existence, Serbian art, in the Kosovo region, reached its peak in the first half of the 14th century. A limited selection of buildings has been made here, most of which date to that period, with the aim of representing the chief stylistic currents and outlining the complexity of ideas on which their sophisticated sculptural decoration and painting rely. These shrines especially exemplify the character of artwork in surroundings exposed to simultaneous influences of Byzantium and the West. In political life, this ancient duality was displayed in the existence of two Serbian lands, Raška and Dioclea (Zeta), which from the second half of the 12th century onwards permanently united their destiny into one state. In art, these dual concepts became clearly manifested as early as the era of the state founder, the Grand župan Stefan Nemanja. 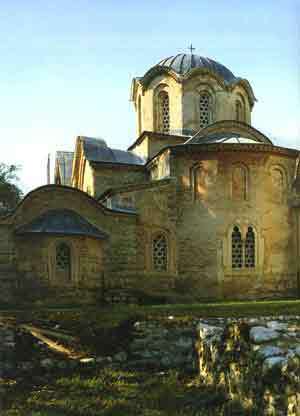 The churches he raised articulated, on the one hand, characteristic features of Byzantine architectural skill, even of Constantinople masters (in all probability, St. Nicholas in Toplica), while, on the other, of Romanesque style, notable in the articulation of the marble facades and the outstanding sculpted ornamentation on the church of the Virgin in Studenica, a level of artistic achievement which was never to be attained in later years. During the 13th century, the Raška school of architecture produced churches of monumental dimensions and harmonious proportions, but, in terms of sculptural decoration, the simple features of their outward appearances were modestly executed in the western spirit. Elements of plastic ornamentation hardly appeared on them; the church of the Holy Apostles in Peć - for a long time the only surviving church in Kosovo invested with some importance, did not have them either. Hence, it certainly is no coincidence that no major sculptural works, typical of the towns in Dalmatia, came into existence along the southern Adriatic coast in this period. The wife of Uroš I, Queen Helen, of French descent provided a powerful inspiration for architecture in the western spirit. When she supervised the building of the monastery of Gradac on the river Ibar around 1270, she engaged master-masons who were the first to make more extensive use of Gothic elements in construction. In the modulation of portals and windows on the main church they incorporated the appropriate sculptural repertoire. At a later time in the coastal region where she ruled after the death of her husband, Queen Helen had an Orthodox church built in the vicinity of Scutary and dedicated to St. Nicholas. She also aided the construction of a much greater number of Catholic places of worship, giving support to members of the order of St. Francis. Early sources reveal that in 1288 she consecrated Franciscan churches in monasteries in Kotor, Bar, Ulcinj and Scutary which echoed the characteristic appearance of religious buildings of the Umbrian-Tuscan type, with a simple, elongated space that could accommodate a large number of believers. These ambitious ventures of Queen Helen were also aided by her sons. A well-preserved inscription from 1290 states that with kings Dragutin and Milutin she had the church of SS Sergios and Bakchos built near Scutary on the bank of the Bojana; this church was subsequently worn away by the river. With her sons dressed in royal robes and herself clad in monastic attire she is depicted praying to St. Nicholas who blesses her in the famous icon of SS Peter and Paul which she presented to their church in Rome. Despite the fact that she had assumed the Orthodox monastic habit, the Dowager - Queen lavishly aided monasteries of her earlier religious denomination. Milutin did the same at a later time: an inscription from 1318 relates to his merits, probably in the renewal of the Benedictine church near Scutary. By protecting his Catholic subjects, the king evidently adhered to the practice of religious tolerance cherished in his country. Of buildings erected by Catholic, not to speak of Orthodox, inhabitants of mining settlements for their religious needs, examples worthy of attention are the fragments still standing of a church dedicated to the Virgin in Novo Brdo, and of St. Peter's in Stari Trg in Trepča the former, like Decani and churches along the coastal region, was built of alternate layers of red and white stone, while the base of the latter church, three-aisled with semi-circular apses on the east side, indicates that its central part was domed as were cathedrals in Kotor and Dubrovnik (before the great earthquake in 1667). Hence, each in its own way - i.e. 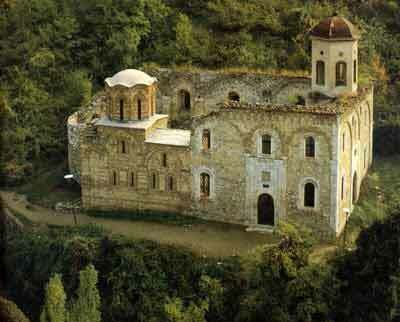 in terms of construction method, dome design - was associated with Orthodox architecture in Kosovo. Revived architectural activity in coastal towns was most certainly connected with their masters' engagement in building projects in Kosovo. Their role was especially conspicuous in the erection of sepulchral churches. It was perceivable, in some details at least, in other structures as well, even those which were typical specimens of the new, Byzantine style. Artists arrived here travelling along the valley of the Drim River, by the road linking Prizren directly with the region of Scutary and further on, by land and by sea, with other towns along the Adriatic coast. Masters from Byzantine workshops came at invitation from rulers from the northern lands of the Empire, and with local artists they fostered a style which was to become typical for Serbian surroundings, particularly in terms of fresco-painting. 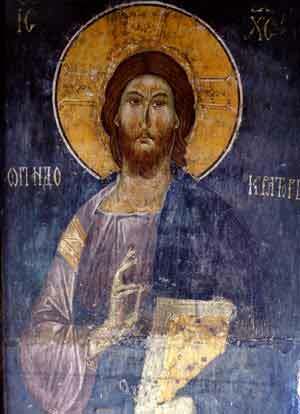 Painting belonged to the inviolable sphere of Orthodox art, within which no concessions were made in Serbia. The complete and absolute acceptance of its iconographic expression, connected with growing religious needs, rendered it possible for masters from local workshops, skillful and experienced, to respond to the high requirements posed by the court. Before becoming king, Stefan Dečanski had ruled over Zeta for some time, and there he had become acquainted with the Mediterranean ambience and the spirit of Western art. After that, under the Byzantine Emperor's surveillance, he spent seven years in his capital whose edifices - erected in the course of its thousand-year history - must have impressed him deeply not only by their size and manner of construction, but also by the opulence of their interiors. His intimate knowledge of ancient places of worship and the ruler's court must have also had an impact on Dušan, who, as a boy, sharing the fate of banishment with his father, acquired his education in Constantinople. It is not simple nowadays to assess the contribution of local artists working either alone in the same spirit, or with masters educated in centers where stylistic expression was constantly changing and representations were gradually becoming an increasingly complex manifestation of theological interpretation. In medieval Serbia within its narrower borders - preceding Stefan Dušan's conquests - the character of painting displayed fewer differences in comparison to the leading stylistic currents in the Byzantine Empire than was the case in some of its other regions with their own local traditions. The reason for this is simple. Serbian rulers and the high clergy, in constant and close touch with larger cities, especially Thessalonica, invariably summoned from their workshops the best artists who represented the latest trends in art and, moreover, directly participated in its transformation. 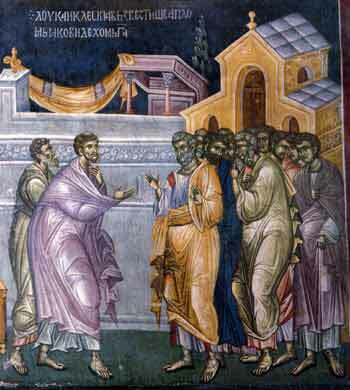 In this connection, it is but sufficient to examine the ascent of wall-painting in the last decade of King Milutin's rule (+1321): frescoes adorning the walls of all the ruler's endowments dating from this period are the creation of the renowned painters from Thessalonica, Michael Astrapas and Eutychios, or the masters from a very close artistic circle. The uncertainty of experts as to whether the frescoes bearing no surviving signatures should be attributed to these Thessalonian artists, known by names, confirms in the best possible manner the unity of spirit and the recognizable kinship of expression, which from the end of the 13th century could be followed from Mt Athos, through Ohrid, to Peć, Prizren and Gracanica. Local artists who worked with famous foreign masters left no information about themselves, nor did the specific features of their creations distinguish them even at a later time when their participation was confirmed by signatures. A telling instance of this is the case of two great painters from the end of the 14th and the beginning of the 15th centuries, Metropolitan Jovan and his brother Makarije, famous for their works in Pelagonija, and in Serbia, in the Morava basin. Their creations, not only in terms of value, but also in style, closely resembled those produced by the most significant masters of that epoch, whose similar works are encountered even in faraway Cyprus. In the epoch of Stefan Dečanski and Dušan, the painting heritage of the first decades of the 14th century was evolved by domestic artists, engaged in the construction of both large and small sized churches in Serbia. 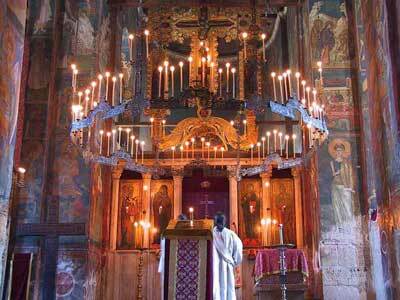 This is best perceived in the painting of the spacious church of Christ Pantocrator in Decani which took ten years to complete. Several groups of artists gathered there They readily responded to the challenge posed by the complex and, in terms of volume, the richest subject-matter in the Byzantine world. The value of their work was in no way inferior to that of artists coming from other corners of the Empire. The remains of frescoes in the formerly grand Holy Archangels, only several years younger than Decani, show the hand of the same or related painters; a similar manner of work has been discerned in other churches as well. Furthermore, direct analogies of the large fresco-sequences could not be found in Byzantium at that time; nether s t possible, as it is in the time of King Milutin, to determine their roots in the centers m which they had been previously noted. Financial wealth and increasing requirements obviously brought about the rise of local workshops. These workshops, like others all over the East-Christian world, were, understandably, always in touch with life in the capital and other towns of the Empire. In large enterprises, apart from the participation of local artists, a significant role belonged to the leading personalities of the Serbian church, educated and widely cultured. Their involvement in the erection and adornment of monuments is revealed by documents, primarily endowment charters, as well as writings belonging to different literary genres. It was noticeable not only in the making of decisions concerning the appearance of a structure, the choice of artists and iconography, but also m the process of finding the most appropriate articulation for ecclessiastical and political ideas. The multitude of historical compositions and effigies of members of the ruling house, the nobility, high clergy and monks, most frequently in the role of founders, reflects the life and understanding of medieval Serbian society. The inscriptions accompanying them accurately record the historical moment and disclose the ambitions of the sovereign, sometimes of a short duration m a changing political reality. In that, painters, even those who came from other countries, displayed a developed sense of careful attention to the spirit of the artistic environment and the requests of those who commissioned the work. 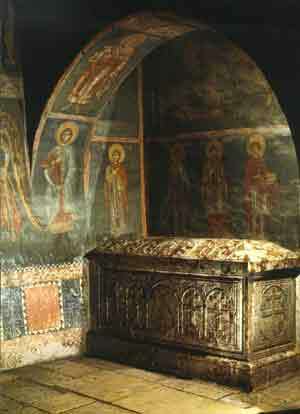 In that aspect, the shrines in Kosovo have preserved the wealth of their uniqueness. In contrast to representations of saints whose images were entrenched in traditional Orthodox iconography, historical portraits, especially those of men, portrayed the person's original facial features in the majority of cases, meticulously registering the character of their clothes and attributes of their social status. 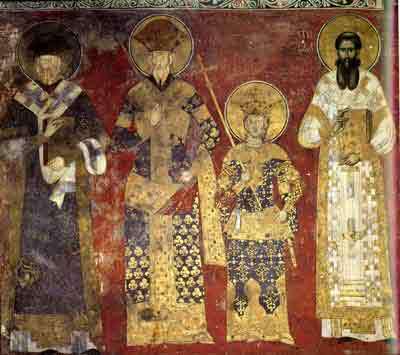 St. Symeon and St. Sava, the founders of the autonomous state and church, were regular features on frescoes, as were expressions of complex state and legal ideas, the emphasis always being placed on the divine origin of rule. The representations of founders took a special place in churches which they raised for their eternal rest. In Kosovo, however, such images have survived only in Decani, in a number not registered elsewhere: the first ktetor, Stefan Dečanski, got four, and the second, Dušan, even five portraits, each in a different iconographic version, invested with a special message. The lost depictions of King Milutin in Banjska, and of Dušan in the Holy Archangels, were undoubtedly particular paraphrases of the same ideas. The latter, as it has been shown, had two - in Serbian art unique - ruling portraits carved in stone, above the entrance to the church and over the tomb itself. Serbian kings of the first half of the 14th century entrusted the design and construction of their large shrines, the carving of stonework and the painting of frescoes in spacious interiors, to masters from provincial workshops, as well as to those from the coastal regions and Byzantine towns, depending on the character of the work and available artistic support. In the free selection of artistic forms, open to western concepts for the outer appearance of churches, they satisfied the requirements of the Orthodox rite in the disposition and function of spatial elements, preserving with consistency the appropriate character of wall-paintings and icons. The faithful in the Middle Ages admired such churches, but did not marvel at them: they were the expression of a specific and exciting - only for the present-day observer unexpected - synthesis that was the natural outcome of cultural circumstances and vital artistic practice. This vitality was felt in the works of the masters from other branches of art. Take, for instance, the handiwork of goldsmiths who fashioned "holy vessels" for the needs of the East-Christian cult, while decorating them with ornaments from the repertoire of western art, just as masters in that same period carve Byzantine and Romanesque (or Gothic) embellishments on the portals and windows of the churches before them. A considerable number of feudal and town churches were erected in a more modest spirit within simpler forms. Only the rudimentary facts about them have been outlined in the appendix. Neither does this list offer a balanced testimony to their number and disposition. Those churches in towns whose remains have been insufficiently investigated, to a large extent have yet to be analyized. One need only to compare their number in towns like Ohrid, Kastoria or Verroia, which preserve their early nuclei throughout Turkish rule, or, at least, have surviving data about Christian structures in the defters (censuses), to project how many of them may have existed in the prosperous centers in Kosovo, with wealthy mine owners or lessees, master craftsmen, merchants and artisans. It has already been stated that, apart from the local population, these places were also inhabited by "foreigners," whose social and legal status was established by law, and implied, among other things, ownership rights, exemption from certain taxes, etc. There were many citizens from Dubrovnik, Venice and Genoa among them. In addition, the mines attracted Albanians whose arrival was prompted by the expansion of the medieval Serbian state into territory to the south of Scutary. The growing exploitation of mineral riches in Serbia and Bosnia gathered momentum from the mid-14th century since mines in Europe were being exhausted. Thus, around Novo Brdo and Janjevo where silver mixed with gold was being excavated, as well as Trepča and elsewhere, tales spread about the rich deposits. The wealth was enormous. Archival data disclose that one fifth of the total European production of silver was exported from Serbia and Bosnia only via Dubrovnik. No churches have survived in medieval fortified towns with suburbs, or in marketplaces where, sometimes several times a year, fairs were held on particular feast-days when merchants from afar assembled offering commodities to the local population. In the last century of independence, however, no further monumental churches followed the completion of the Holy Archangels. With the revenues continually yielded by the mines, churches were built in the north, chiefly in the Morava River basin where the center of the state moved under the rule of Prince Lazar and his heirs. The monasteries on Mt. Athos were also lavishly furnished with gifts of silver. The quantities of this precious metal were expressed in characteristic liters or ounces, not in the currency unit in circulation at the time. 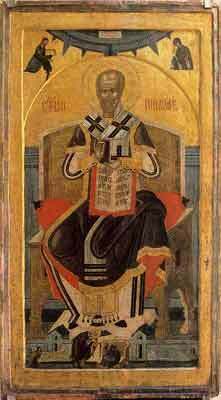 On the other hand, Peć, with "the throne of St. Sava," remained the heart of Kosovo spiritual life. The Church viewed Prince Lazar (1371-1389) as rightful heir to the Nemanjićs and bearer of sovereignty over all Serbian lands, as expressed in his title and the manner in which he was addressed by state representatives and ecclesiastical dignitaries from other countries. The reestablishment of canonic relations with Constantinople, interrupted because of the conflict brought about by Stefan Dušan's proclamation as emperor and the elevation of the Serbian Archbishop to the rank of Patriarch, was of utmost importance both for the political position of the country and the peaceful existence of the Serbian church. These important issues were discussed at councils in Peć summoned at Prince Lazar's initiative. 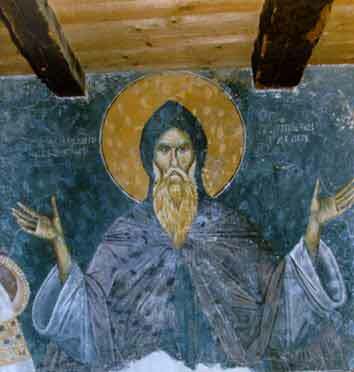 Through the mediation of Athonite monks, an agreement acceptable to both churches was reached, and above the grave of the Emperor Dušan in the Holy Archangels in Prizren, in 1375, the decision of reconciliation was proclaimed in the presence of envoys from the Patriarchate of Constantinople. After that, the Prince commenced the construction of his large monastery of Ravanica, to which his body was transferred, first buried in Priština after his death, a year after the battle of Kosovo (1389). The disturbances and pressures that forced Lazar's widow and son, the young prince, to recognize the Sultan's authority as vassals, left traces on the grand endowments of the Nemanjićs. In 1377, Princess Milica paid a visit to Decani and, as stated in her granting charter, came across "a genuinely pitiful sight": the monastery was burned down and devastated by "the vile Ismailite people." She restored to the monastery the estates that had been taken from it and conferred upon it several of her own; she also renovated the bronze polycandilion dating from the time of church construction, the largest surviving specimen of its kind in the Byzantine world. A wide, circular ring, held by twenty-meter-long "chains," suspended on the base of the dome, illuminated the interior during evening prayers with dozens of candles and hanging lights. Its parts - all together, there were around 600 - had perforated ornaments, and in the circles with decoratively linked letters, as was the custom, was the name of its founder: Stefan the King. The Princess, at that time the nun Eugenia, commissioned a similar piece to record the memory of her sons, Stefan and Vukan and herself in the same manner. At a later time, popular tradition concocted the legend that the choros had been forged out of the weapons of the warriors fallen in the battle of Kosovo. Until the final conquest by the Ottomans in 1455, modest-sized churches whose founders and time of construction are, in the main, unknown, continued to be built in towns, on feudal estates and monastic metochia. In the long centuries of Turkish rule, people gathered in these ecclesiastical buildings collecting contributions in order to restore them, protect them from demolition, and re-paint the frescoes, or, at least, replace damaged ones, adorn interiors with icons and furnish them with liturgical vessels. With the passage of time, however, as the religious and ethnic structure of the population has changed, these efforts have decreased. The overall survey of hundreds of Christian places of worship - although itself incomplete attests to lively religious life and the character of the environment over the course of centuries. Their density and disposition is shown on the map in the appendix. Several large structures that supplement this picture have, fortunately, survived. The most significant of them, as regards its influence and role in the organization of spiritual life and the preservation of national consciousness, was the Patriarchate of Peć - until the fortunes of war turned against the Austrian general Piccolomini whose campaign had won support of the Serbian people in Kosovo. Fearing retribution, they were compelled to move into regions across the Sava and the Danube (1690). The first decades of the 18th century mark the beginning of the withdrawal of the Ottoman Empire. The authorities moderated the position towards their subjects of other religions and after the first Serbian uprising (1804-1812) they were forced to accept the demands of the Great Powers, especially Russia, to protect the Christian population in the Balkans. Although after the Berlin Congress (1878) Turkey gave preference to Islamized immigrant clans as a protection against Serbia and Montenegro who were preparing to liberate their people, the Sultan's regular army had to safeguard the monasteries in Kosovo against inroads and plunders of highlanders who descended into fertile plains. 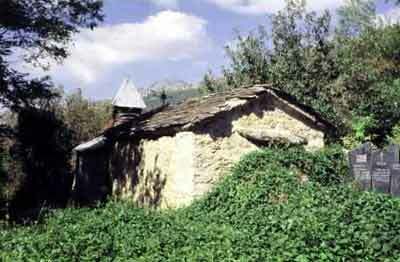 In Decani, Devic and the Patriarchate of Peć there were garrisons of Turkish askers that fraternities provided with board and lodging, just as they were paid by the "hereditary chieftains" from certain Albanian clans to defend them. In 1912, when Serbia and Montenegro finally liberated Kosovo, Metohija and the entire territory of Old Serbia, NOT A SINGLE Islamic shrine was demolished or desecrated - not the Bajrakli Mosque in Prizren, the Imperial (Fetih) Mosque in Pristina, the Hadum-Mosque in Đakovica, or Murad's Turbeh on the field of Kosovo in which an icon lamp burns today on the site where Sultan Murad I was killed. Nor have any of the residences, towers or structures of historic import suffered, the best confirmation of this claim being the Sinan Pasha Mosque in Prizren, built exclusively with stones and fragments of architectural decoration brought from the Holy Archangels; the Orthodox population and the authorities of the Kingdom of Serbia did not allow their demolition. "A ruined shrine is still a holy place" - states a notice from that period - "and to demolish a place of worship that has become a shrine of another faith amounts to commiting an evil deed. Revenge is contrary to God's justice, always more pressing and attainable than human." During World War II when the territories of Kosovo and Metohija were an Italian protectorate the local Albanian authorities attempted to demolish the memorial church in Đakovica along with the charnel-house of Serbian soldiers fallen in 1915. This act was prevented by the Italian military command. After the war, in 1950, the church - charnel-house was nevertheless pulled down by the local government on the basis of a petition with signatures extorted from local Serbs, chiefly members of the Communist party. At the same time, none of the 18 mosques and 12 tekias in Đakovica were touched. Such an act encouraged attempts to devastate Devic, damage Decani and desecrate Gracanica and the Hermitage of St. Peter of Koriša. Finally, under circumstances which were never officially explained, on 16 May 1981, the large dormitory of the Peć Patriarchate burned to the ground. In our times, the shrines in Kosovo continue to hold the attention of historians, art historians, archaeologists and conservators. A considerable number of them have been protected, and the work undertaken has brought to light new and valuable discoveries. The future of these culturally significant enterprises will depend on elementary living conditions and a readiness to put into effect international obligations contained in the convention on the protection of world cultural heritage adopted at the United Nations Conference held in Vancouver in 1976. Article no 9 reads as follows: "The right of each country is to be, with full sovereignty, the inheritor of its own cultural values which are the fruit of its history, and it is its duty to treasure them as values representing an inseparable part of the cultural heritage of mankind."